Some of the most common workplace injuries in the tool and die industry are related to the heavy weight of the dies we work with. Between dies falling on an operators foot, or an operator straining their legs or back in heavy lifting, moving dies around your shop can be hazardous. 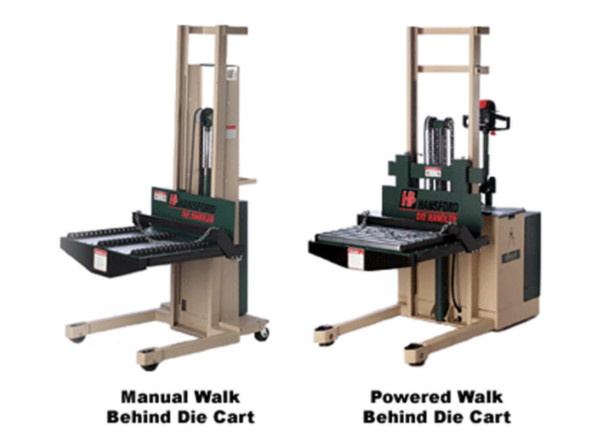 We offer two series of Hansford Die Carts, and both were built with your safety in mind. The manual walk behind comes in three different models, giving you options for the height of the vertical lift. The powered walk behind features motorized wheels to make moving through your shop floor easier for those heavier die sets. Both series have multiple safety features and the benefits of those features extend to both your workers and your business. This feature is designed to prevent overloading on the vertical lift. While it’s important to get the die set up onto your Die Handler or into a press, a die set that is too heavy could potentially tip the die cart over. The safety bypass valve will prevent the tipping by preventing a die that’s too heavy to be lifted higher than the lowest setting. This easy to see red button sits on the top of the steering handle. When it’s pushed the cart machine changes directions of the unit. Pressing this button will immediately stop all functions of power to the unit. This material is a type of plexiglass, which is resistant to many impacts. It is also more scratch resistant than other plastic products. Acrylic offers the clearness of glass without the vulnerability to breaking. The added benefit of this protective layer is that it allows the operator to move through the shop with an unobstructed view. A simple mechanism, yet a powerful safety feature. This lock is easily engaged by the operator stepping onto it and will prevent the die cart from moving forward or backward during the loading or unloading of a die set. This special feature of the Hansford Die Carts is highly valued by operators because it turns what used to be a multi-person job into a procedure which can be safely done by a single operator. Combined with the three options of platform styles, the powered push/pull capabilities make the die cart a featured machine of any shop. The greatest feature of the die cart is allowing a single operator to move the die set around the shop. This frees up other workers to focus on their projects without being interrupted to give a helping hand. The die cart’s capabilities allow for a single operator to safely and efficiently move die sets around the shop. The major benefits of this are two-fold: when only one person is required there is no need to coordinate finding extra hands to help out, and the powered lifting means that a single operator can move the die set to and fro with extreme ease. As mentioned at the start, common workplace injuries are involved with strain due to heavy lifting. 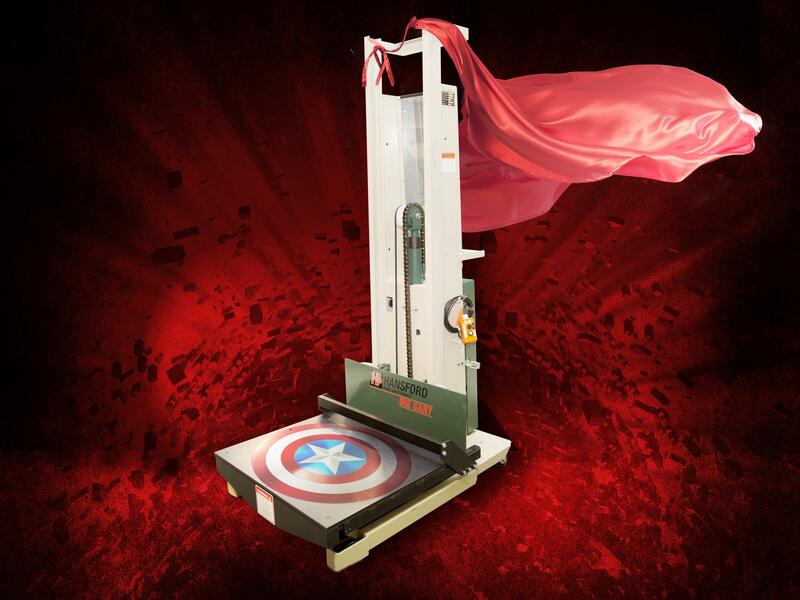 Because the die cart does the heavy lifting for you, along with the combination of the many safety features, lifting heavy dies has never been easier or safer. If you don’t already have a die cart (or two!) in your shop, do your workers a favor and get one. Having a Hansford die cart in your shop will increase productivity and will keep your workers safe. Please keep in mind that standard safety practices apply to handling machinery: only appropriate and competent workers should operate machinery. It is important to inspect machines daily to ensure they are functioning properly. Get in touch with Hansford today to get your new die cart! Hansford Parts and Products is committed to the main principle that only through continuous improvement and learning can true progress be made.